I love Mexican food. I also love easy recipes and ones that don’t require any cooking. 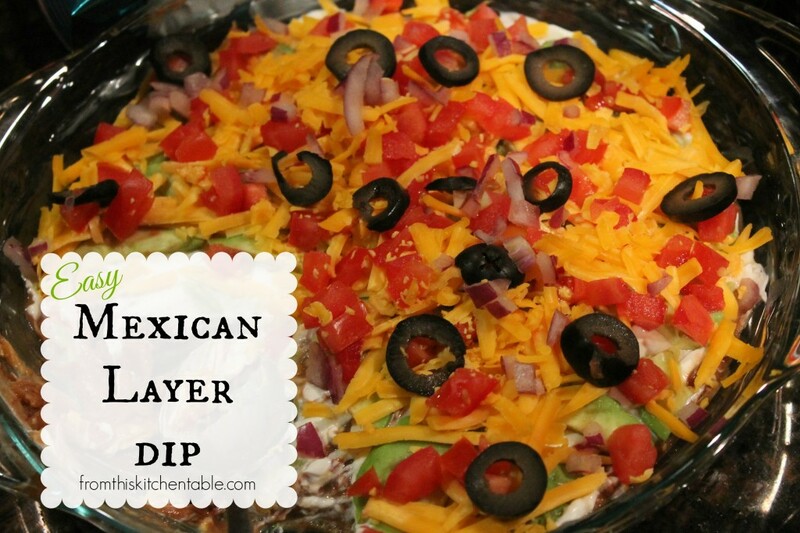 This recipe is similar to 7 layer dip and makes a perfect party food. My siblings (okay, maybe me too) even enjoy having it for a simple supper. The layer of sliced avocados is the perfect twist that most people haven’t experienced in a dip before. Make it ahead of time and store in the fridge and you have one less thing to worry about the day of your party. Don’t forget to find all the recipes for layer dips with an international flair here. Mix beans and taco seasoning together. Adjust with salt and additional seasoning to taste. Spread in the bottom of a pie pan. Spread with a layer of sour cream. Cover with the sliced avocado. Top with cheese, tomato, red onion, and olives. This entry was posted in Appetizers on January 3, 2014 by Deanna Michaels. This dip looks so yummy! I’m a big fan of Mexican food so I’m sure that I’m going to enjoy making this. Also the fact that it looks really easy to make is a big plus! It is super good. I love Mexican and easy recipes as well. The sliced avocado makes it perfect. Thanks for stopping by. Hi Deanna! I’m stopping in from Let’s Get Real today. This dip sounds so good. I load all of that yummy goodness into my tacos. I bet it is just perfect as a dip. I am looking forward to following along to see the other dips as well. My husband’s birthday gift is always a super bowl party so I’m always looking for great snacks for this event. It is really good. I love the Indian and Oriental ones as well. Okay, maybe they are actually all good. Thanks for stopping by and hosting the link up! It looks delicious I ‘m pinning it to my pinterest board. I’m always looking for new dip to try. Thanks for coming by again, Kim! And for pinning. It is so good. Love the sliced avocado. The 4 other layer dips coming up on the next 4 Fridays are super good too. My favorites might be the Indian and Oriental ones. It is perfect for the game! The other layer dips that are coming up the next 4 Fridays are great options too and a little more unique! I LOVE the Indian and Oriental ones the most. I think. 🙂 Thanks for stopping by. This looks super yummy. I was making a list for Super Bowl and I can’t wait to try this. Pinning for later use. It is sooo good! The layer dips that are coming up the next 4 Fridays are amazing too. The Indian and Oriental ones might be my favorites. Thanks for stopping by. Ha ha. I do the same thing. They are soo good. At least they are pretty healthy. I found the Oriental and Inidan ones that are coming up later in the month the most addictive. Thanks for stopping by. This looks like YUMMY game day nibbles!! #pinning. It is sooo good!!! Thanks for stopping by and for pinning. The Indian and Oriental ones coming up later in the month might be my favorite dips! Oh my, this looks awesome too! I think Mexican food is my absolute favorite, so I will add this to my party go-to list. Pinning this too! I’ll have to keep an eye out for them! I’m posting one every Friday in January! This dip looks so yummy! My husband has to avoid all processed food and I’m looking for recipes to take to a Super Bowl party that he can eat – this will definitely fit the bill. Thanks for posting. Visiting you from Good Tips Tuesday. Thanks for stopping by! It is a wonderful dip. Mexican flavors are always crowd pleasers. I love the other dips coming up too. The Indian and Oriental ones might be my favorites, but I love them all. It is soooo good! The other dips still coming up every Friday this month are delish too and even more unique. Thanks for stopping by and for pinning! Yumm, this looks tasty! 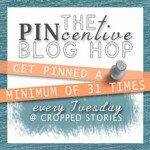 Thanks for linking up to Good Tips Tuesday this week! Your recipe has been pinned to our GTTuesday board. Hope to see you again next week! It is incredible!!! I love Mexican flavors and avocado. Thanks for pinning. This looks amazing! I am not the best cook, but this looks like something I could cook well! It is good! You are right, it’s really simple to put together. Perfect for supper or potluck or super bowl snack! The other dips are great too! I think 3 of the 5 are posted and the next one comes on Friday. It is amazing. The sliced avocado makes it about perfect. I love how easy these dips are to adapt to personal taste. The other layer dips are super good two. I think 3 of the 5 are posted. Next one comes on Friday. G’day Deanna and again looks very yum and healthy! Thanks so much for hosting and stopping by!It is a fabulous dip! I love avocado in pretty much anything! Love this dip… Thanks for sharing them on Foodie Friends Friday Linky Party and I hope that you will join us again this week for our Snack Food theme party. It is fabulous! The avocado makes it even better. Thanks for hosting!